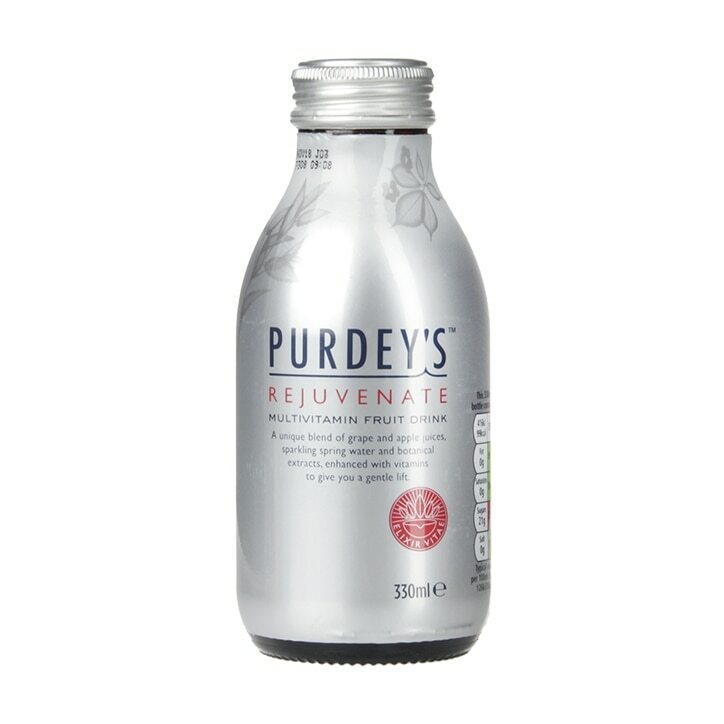 Purdeys Rejuvenation Multivitamin Fruit Drink is a unique formula of fruit juices, sparkling spring water, natural herbal extracts and vitamins, which provides a healthy and immediate way to feel refreshed at any time. Whether you need a morning energiser, afternoon refresher or an evening pick me up, Purdeys hits the mark. Fruit Juices from Concentrate 57% (Grape, Apple), Carbonated Spring Water (42%), Natural Flavourings including Botanical Extracts (Damiana and Chinese Ginseng), Citric Acid, Vitamins (C, Niacin, B6, Thiamin, Riboflavin, Folacin, B12), Glucose. Purdeys Rejuvenation Multivitamin Fruit Drink is rated 4.5 out of 5 by 12.